How to Clean your AirSnore? The AirSnore is a simple device with no moving parts, buttons, or calibration. This makes it easy to clean and maintain. Mandibular Advancement devices can deteriorate over time, due to the saliva they are exposed to during use. This can cause bacteria or even a breakdown of the device compound. Nobody wants to put an unclean anti-snoring mouthpiece in their mouth. A deteriorated device can also cause a lack of performance. The AirSnore company recommends the device be cleaned after each use. Do this by soaking the device, immediately after use, in a glass of cold water mixed with a little toothpaste. Let it dry before using again. Read on for other more convenient ways to clean the AirSnore. Luckily, there are simple, effective ways to clean the AirSnore. We recommend the iSonic mouthguard cleaner, available at Amazon. 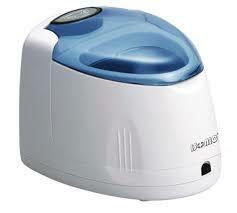 The iSonic is an ultrasonic cleaner that does a full clean in five minutes. Place a spoonful of iSonic ultra-clean powder in the iSonic, along with your AirSnore, and it will be good as new. iSonic can also be used in dentures and jewelry. Read our review of the iSonic machine for more details. The AirSnore can also be cleaned with denture powder or denture tablets for 30 minutes in a cup of water.